I subscribe to both Crunchyroll and Funimation. I find that both are well worth the investment! Note: With Crunchyroll, I generally watch the new releases. With Funimation, I find that I choose a mix of new and old. So, please expect to see both on this list! Future Diary: Yukiteru is really excited to have a cell phone that tells the future, until he discovers the price: he’s trapped inside a game where the last one standing wins godhood. Of course, that means everyone else must die and are therefore your enemies. In Yukiteru’s case, though, his ally might be worse than all of his enemies combined! Assassination Classroom: An artificial alien that looks like an octopus and who can travel Mach 20 recently destroyed the moon. For his next act, he says that if no one can kill him before the end of the school year, he’ll destroy the Earth! He took over training for the low-achieving class at a prestigious high school. The students are conflicted: he’s the best teacher they ever had and he seems to genuinely care for them. Yet, he’s threatening to destroy the world! Suzuka: A new high school student falls for an amazing athlete, who seems (sometimes) to like him. He has a terrible time trying to understand why she so often changes how she treats him. It may sound run of the mill, but the characters have grabbed my attention. Blood Blockade Battlefront: A Lovecraft-like realm has collided with several cities on Earth. This anime follows a delivery boy with eyes that can see through any illusion who joined a covert team who tries to keep the peace. The challenge before them: find out who’s trying to destroy the connection between the two worlds. The frantic pace and detailed, almost disturbing world is a huge draw for me. 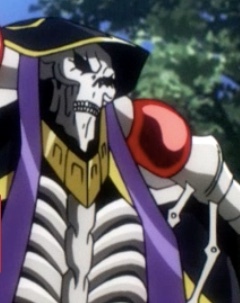 I thought Overlord’s main character was striking. Picture from the Funimation site. : This show follows a high-level Magic Caster who stays logged in when the company shuts down his favorite game. He’s surprised to find that the world doesn’t disappear; he’s further surprised to find that it seems like he’s immersed in a new reality! At first, I thought this might be a Sword Art Online (SAO) or Log Horizon knock off, but so far, this series has exceeded my expectations. The main character, Momonga, reacts in a way that strikes me as realistic, and I really enjoy the entire supporting cast, who, for the most part, used to be non-player characters (NPCs). Momonga seems to really care about them, and the series has focused so far on him trying to get a handle on what’s happening and keeping them safe. Gangsta: In some ways, a crime-burdened, economically poor world has become a cliche. This series found a way to breath new life into that meme, which one main character’s who’s deaf and another who’s a gigolo. Both, though, are dedicated to their version of justice, and they work as “handymen” to help the police and other less savory characters keep the peace. I enjoy the mood the series established, and I always enjoy seeing a realistic portrayal of deaf characters. Sky Wizards Academy: This series follows a once-great Sky Wizard as he tries to train the lowest-performing fire team to be effective. In some ways, this series uses tired garam-style tropes. However, I do enjoy the teaching approach Kanata Age took with his three students. That, along with the world, have kept me watching the show.